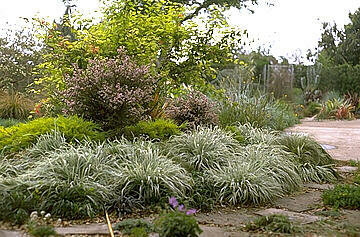 This semi-deciduous, low growing (8-12") white-variegated clump grass forms bulbous nodes at ground level. Good in perennial borders or as an accent plant. Looks best if cut to the ground after summer flowering. Plant in light shade to full sun (along coast); and although this plant will tolerate fairly dry conditions, it looks better when watered regularly. Native to Europe. This garden planting of the bulbous oat grass and Ophiopogon clarkei under a Trinadad flame tree (Calliandra tweedii) and surrounded by Coleonema 'Sunset Gold'. The geranium in the foreground is Geranium himalayense. This garden area was planted in 1986 and was one of the first of many grass plantings in the "Wild Garden" behind the nursery.